What is Blogging and How Can It Help My Home Business? Blogging first started as a way to have an online personal web log, in which a person would journal about their day. From "web log" came the term "blog." Like most new innovations on the Internet, many entrepreneurs saw marketing potential in having a blog, and blogging took off from there. Not only can a blog be used for marketing, but also, a blog can be a home business in and of itself. Here's an overview of what a blog is, why it's popular, and tips to starting your own blog. Many people are confused over what constitutes a blog over a website. Part of the problem is that many businesses use both, integrating them into a single web presence. But there are two features of a blog that set it apart from a traditional website. Blogs are updated frequently. Whether it's a mommy blog in which a woman shares adventures in parenting, a food blog sharing new recipes, or a business providing updates to its services, blogs have new content added several times a week. Websites might occasionally have new information, but for the most part, they offer static, rarely changing information. Blogs allow for reader engagement. 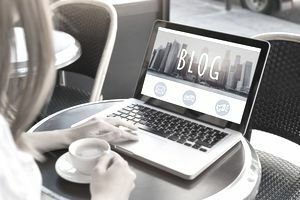 Blogs are often included in social media because of the ability for readers to comment and have a discussion with the blogger and others who read the blog. In the past, websites had guest logs where people could say they'd visited, but a blog allows for conversation and greater interaction than a traditional website does. Why Blogging Is So Popular? Search engines love new content, and as a result, blogging is a great search engine optimization (SEO) tool. Blogging provides an easy way to keep your customers and clients up-to-date on what's going on, let them know about new deals, and provide tips. The more a customer comes to your blog, the more likely they are to spend money. A blog allows you to build trust and rapport with your prospects. Not only can you show off what you know, building your expertise and credibility, but also, because people can post comments and interact with you, they can get to know you, and hopefully, will trust you enough to buy from you. Blogs can make money. Along with your product or service, blogs can generate income from other options, such as advertising and affiliate products. Blogging is flexible and portable, making it a great option for people who be a lifestyle entrepreneur. What is the downside to blogging? Blogging requires a great deal of time. For blogs to be effective at SEO and engaging readers, it needs to be updated regularly. The Internet is littered with abandoned blogs that haven't been updated in months or even years. The success of blogging comes from having people return, and they only return when there's new stuff to read. That means generating content at least several times a week, which takes time. You need ideas to write about. To keep the content coming, you have to have ideas to write about. The good news is that you don't have to write it all. You can have guest writers or hire freelancers. Another option is to curate content from others or do an alternative post, such as using video. Finally, you can buy private label right (PLR) content, and modify it for posting on your blog. You need to offer more than blog articles. At one time, posting an article was enough to generate traffic and income. Today, a successful blog needs email marketing, additional perks such as content upgrades, and an engaged social network, such as a Facebook group. The payoff isn't immediate. One of the biggest frustrations with blogging is that it's time-consuming with little payoff in the beginning. It takes time to build up a readership and momentum. The good news is that starting a blog or adding a blog to your existing site is relativity easy and affordable. There are free blog options such as WordPress.com and Blogger, but to retain control and professional image, consider investing in a domain name and hosting, and installing WordPress or other content management system on your host. Most webhosts offer this. Once your blog is up and running, you need keep it active with new content to grow your business. Develop a set schedule for writing and posting blog articles. Create a content calendar so you always know what you're going to post. Like all other business ideas, your success comes from marketing, and letting your target market know about your blog. Great ways to reach your market are through social media, email list, and reaching out to other bloggers, podcasters, and media outlets for publicity. Repurpose your blog content to promote your business, such as using quotes on Twitter or Instagram, creating a video of your article, and more. Step Four: Add Income Streams. While your blog can compliment an existing business, it's also a great way to add additional income streams to your home business. You can promote other companies' products and services in affiliate marketing. You can offer advertising or feed ad networks, such as AdSense, on to your blog. If you have a service business you're promoting with your blog, you can create your own information products to compliment it. Or, if you have your own product, you can offer a service.